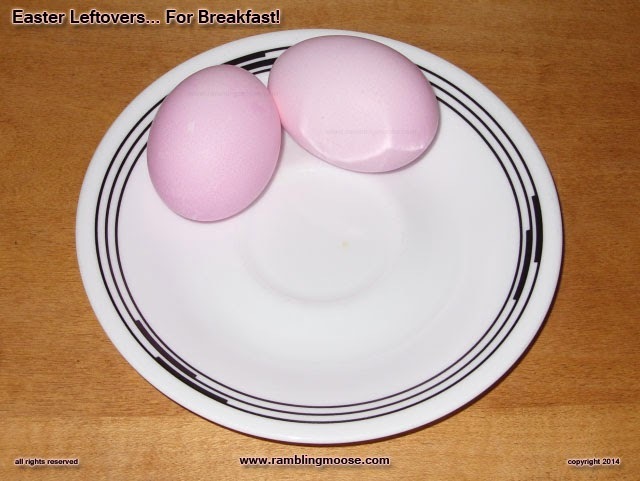 Rambling Moose: Moose Made Easter Leftovers For Breakfast! "Did you get silly in the kitchen again?" "No, I was reading too much." I got hungry. It was time for breakfast anyway. 8AM on a Sunday morning. Actually, it was Easter Sunday, and I got to thinking. I had just finished a small bowl of Biscuits and Gravy. Granted, the gravy was from a jar, and the lot was microwaved to make it hot and tasty, but that was not a problem at all. You see I got creative. I was thinking about having breakfast. Since I had finished the bagels, didn't want to buy any, and certainly didn't have any time to make some bagels at 8AM, I'd have to improvise. Our house was tunneled under to replace the sewer lines and this entire week was a nightmare of having construction, demolition, and other oddball nonsense here. I couldn't use the kitchen like I normally would. Yesterday, since the sewer pipes were repaired, I was able to bake two batches of bread. One "conventional" and one Sourdough. But no bagels, and no pretzels. Staring at the eggs on the top shelf of the refrigerator, I knew I was going to have some. Opening the freezer I grabbed the sourdough rolls, warmed one up. I wasn't really interested in being a fry cook so I put on a pot of water. The Easter Moose Was Going To Visit! I found the red food coloring, and got the water boiling. It was a crimson roiling pot of water by the time I was done. Walking out to the next room, I found an old candle. I'd be slick! I would put lines and designs on the eggs and they would be all nice and fancy! There were five eggs, I wasn't making a mass of them especially since I was the only person in the house that eats the things. Right out of the gates, I managed to crack one egg with the candle. Ok, that goes back into the refrigerator. The other four got their designs. The water was at a full boil now, so set the egg into the water. Immediately it sank to the bottom of the pot and began to fog. No, I didn't want pink egg drop soup. Egg number two was perfect as was egg number three. More egg drop soup. There was a bulge of egg whites streaming into the water, mixing with the food coloring, and making it all look like a bad imitation of a Chinese restaurant. I could use some proper egg drop soup today, but not for breakfast. More improvisation, I guess I'd eat those two. Having just finished the Biscuits And Gravy, I knew I would have to do something with the two imperfect eggs. I didn't know how dark the shells would be when I pulled them out of the water, but since this was just basically all for fun and my own entertainment, it didn't really matter. Yes! I was playing with my food! I waited a reasonable amount of time, then fished out the two cracked eggs and their blobby exterior. It was time to make an egg salad sandwich. I cracked the eggs, burning my fingers because I was rushing and didn't want to wait for the time. Rack was snuffling around and watching me wondering why I was doing all this insanity. Snarling at the heat, I managed to get the eggs unshelled, and I mashed them into the sausage gravy leavings. Adding a teaspoon of Mayonnaise, I was done. The egg salad went into the warmed sourdough roll like a pastel spread. White, Pink, and Yellow. This was breakfast. No, there were no kids involved except Me, The Cook. I simply decided that I wanted Easter Eggs and I would have them. Sometimes an adult has to do what an adult has to do. Maybe I was just in overload of the hype of everyone else doing Easter Egg Hunts and looking for lost pastel colored eggs that the five year old couldn't find under the couch. Better go look, it's going to smell funny in a couple days. The results? Pink Easter Eggs. I guess the wax melted off into the water. Probably ended up in my stomach somehow. The Egg Salad? Could have used some pickles and onions. Oh well, at least I have two more pink eggs for later! One for dinner tonight, one for lunch tomorrow maybe. Hmmm... this could be A Thing (TM). Hard Boiled Pastel Colored Eggs in the Summer. Easter Eggs! They're not just for Easter any more! Have an Easter Egg for Halloween. Oh wait, that was yesterday. Never mind!